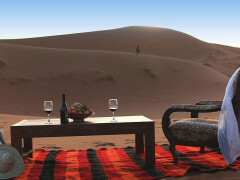 Why explore North Africa with a Morocco Signature Tour? Morocco - The faraway, mystical land that’s so close to mainland Europe, yet so often forgotten. It’s a land of cobbled streets and ancient medinas where the scent of exotic spices and dried figs carries you to a bygone era when everyone wore Tommy Cooper hats! This twelve-day trip offers you the chance to become immersed in a country that seems to have been created for the sole purpose of seducing your senses. Stroll through wonderfully chaotic souks where vendors sell everything from cured olives, delicate pastries, incense, and of course, luxurious hand-knotted rugs and Fez hats. By day, you’ll ride camels in the Sahara Desert, explore ancient tombs and visit charming seaside villages. In the evenings you’ll discover luxury retreats steeped in local traditions when you relax in a mix of elegant Relais & Chateaux riads decorated with mosaic tiles and stained glass, and sumptuous tented camps in the middle of the desert. 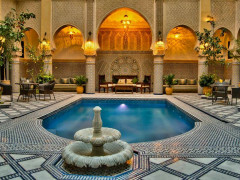 What makes Marrakech, Fez and Rabat so enchanting? With your personal guide, you'll explore the World Heritage Site of Fez and bustling streets of Rabat. Your English speaking driver will take you on an adventure to the striking dunes of Erg Chebbi to watch the dramatic sunset and changing colours of this other-worldly landscape. You’ll tour Marrakech, visit the 12th-century Koutoubia Mosque, the El-Bahia Palace, and the famous Saadian Tombs. Enjoy a horse-drawn carriage tour through Yves Saint Laurent’s Gardens of Majorelle Oasis. From there, you’ll continue on to the charming seaside village of Essaouira where fish stalls, colourful markets and dramatic fortifications decorate the coastline. You’ll tour Marrakech, visit the 12th-century Koutoubia Mosque, the El-Bahia Palace, and the famous Saadian Tombs. Enjoy a horse-drawn carriage tour through Yves Saint Laurent’s Gardens of Majorelle Oasis. From there, you’ll continue on to the charming seaside village of Essaouira where fish stalls, colourful markets and dramatic fortifications decorate the coastline. Your signature tour through intoxicating Morocco will leave you dizzy with delight - for the full itinerary (cos this is just the half of it!) click the link! Your signature tour through intoxicating Morocco will leave you dizzy with delight - for the full itinerary (cos this is just the half of it!) click the link!